The following are brief descriptions of the various types of heart disease that we diagnose and treat at Emerson Cardiovascular Associates. As cardiologists who are trained in and emphasize preventive care, we work with patients to perform a comprehensive evaluation and design a personalized plan of care aimed at keeping you healthy. Coronary artery disease (CAD) is caused when plaque, which consists of fatty material, including cholesterol, forms in the lining of the coronary arteries. CAD is a progressive disease; as the space in the blood vessel narrows, the heart must work harder to pump blood through the vascular system (blood vessels). Chest pain, known as angina, is a common symptom, as is pressure, aching or tingling in the back, neck, throat, jaw, arms or shoulders. Individuals with CAD may also complain of feeling tired and experiencing shortness of breath, dizziness or nausea. As the artery becomes further blocked, plaque or a blood clot potentially can lodge in the artery and produce a heart attack, which deprives the heart of oxygen. There is a range of treatments available for CAD, including medication, angioplasty and heart surgery. Lifestyle changes involving diet and exercise also are important to stemming progression of CAD. Many people have heart murmurs—extra heart sounds that a physician can hear with a stethoscope—but only some of them require treatment. Similarly, heart valve problems don’t always cause symptoms, which may include wheezing, coughing or shortness of breath; difficulty breathing when lying down; unexplained weight gain; weakness or fatigue; and swollen ankles or feet. For heart murmurs and valve problems that merit closer attention, we can provide diagnostic services and monitor your condition over time. When necessary, we will specify treatment, including medication, valve repair or valve replacement. A diagnosis of heart failure means the heart is not pumping as effectively as it should. As a result, fluid tends to gather in the lower extremities (legs and ankles) or in the lungs. The condition may cause other symptoms, such as weakness and shortness of breath and coughing on exertion. Heart failure usually is caused by another heart problem, such as coronary artery disease, a heart attack, high blood pressure or valve disease. There are two types: where the heart’s pumping function is weakened and where the pumping function is normal, but a mechanical problem in the heart leads to heart failure. With good care management, most people with heart failure can avoid hospitalization and live well with this condition. With the right support, individuals with heart failure can live well and even improve their health. For most people, a combination of medication, lifestyle changes and self-monitoring can avoid hospitalization and allow them to live well. Our nurse practitioner, works closely with our cardiologists to provide extra care to patients with heart failure. Living well with heart failure requires a treatment plan that includes maintaining a low-sodium diet and checking one’s weight regularly to watch for fluid retention. Our nurse practitioner spends time with patients—and their adult children—to be sure they understand this important part of their self-care. She also assists with medication management, all with the goal of extending the healthy periods and avoiding hospitalization. A change in the pace or pattern of the heartbeat is called an arrhythmia. There are various types, and many don’t interfere with life. However, some arrhythmias require testing to determine if treatment is necessary. Atrial fibrillation, the most common cardiac arrhythmia, is associated with a risk for stroke. For many patients, medication is effective at regulating the heart’s rhythm. But other arrhythmias, including those that produce either an abnormally slow or very fast pulse, can be life-threatening. Through careful examination and testing in an electrophysiology lab, we can determine if a device-based therapy, such as a pacemaker or implantable defibrillator, is needed. Similar to coronary artery disease (CAD), blood vessels distant from the heart also can become blocked. In fact, people who have been diagnosed with CAD are at risk for developing vascular disease, often referred to as peripheral artery disease (PAD). If you have leg pain when walking that disappears when you are at rest, you may have PAD in your legs and should be evaluated. If you have neurologic symptoms or have had a transcient ischemic attack (TIA, also known as a “mini-stroke”), your carotid arteries, which carry blood to the brain, may be blocked. Treatments for vascular disease include medications, procedures to open the blocked blood vessels and bypass surgery that provides a route for blood around the blockage. Congenital heart defects occur while the fetus is developing and may or may not cause symptoms at the time of birth. The most common congenital heart disorders that affect adults are valve defects, atrial and ventricular septal defects and patent foramen ovale (known as “hole in the heart”). As a result of breakthroughs in pediatric heart surgery, many individuals live healthy lives despite being born with a congenital heart condition. However, even those who had successful surgery should be seen by a cardiologist throughout their adult years. High blood pressure: You should aim for a healthy blood pressure—no higher than 120/70. Once your blood pressure reaches 140/90, treatment is typically recommended. Over time, high blood pressure can damage the blood vessels, so it is important to bring it under control. There are many effective medications, but you can help keep your blood pressure down by losing weight, eating a low-fat and low-sodium diet, exercising and limiting alcohol intake. Diabetes: The high blood sugar associated with diabetes can damage blood vessels throughout the body, which can lead to the development of plaque. One-third of those with diabetes have coronary artery disease. Obesity: Those who are 20 percent or more above their target weight are at increased risk of developing cardiovascular disease—by 46 percent in men and 64 percent in women. In addition to putting a strain on the heart, being overweight makes it difficult to control high blood pressure, high cholesterol and diabetes. Heart disease is still the number one killer of both men and women. However, advances are improving the statistics every year. Today there are many more treatment options for individuals with heart disease than used to be the case. A generation ago, there were only a few heart medications available; now there are dozens. We work with our patients to find the correct medication and dosage that will control symptoms and maintain the cardiovascular system. Cardiac catheterization is one of the most common procedures performed on individuals who are experiencing troubling symptoms, such as chest pain or angina. A cardiac “cath” may be performed to determine if you have coronary artery disease (CAD) and, specifically, to precisely locate a blockage. In this regard, cardiac catheterization is a diagnostic procedure. However, if a blockage is found, the cardiologist may decide to provide treatment at the same time. Often, the treatment is angioplasty, in which a tiny balloon is inserted and inflated in order to open the blocked coronary artery. The cardiologist may decide that placement of a stent—a wire mesh tube—is needed to keep the artery permanently open. If a cardiac test, such as an angiogram or cardiac catheterization, determines that you have a blockage in one or more coronary arteries, you may be a candidate for an angioplasty, along with placement of a stent. Angioplasties are one of the most common interventional treatments performed today. They are performed in a cardiac catheterization lab; if your diagnostic cardiac “cath” confirms that you have a blockage, the cardiologist will probably decide to perform an angioplasty at the same time. The procedure involves the insertion of a balloon-tipped catheter, which is inserted into an artery, either in your groin or wrist, and advanced to the precise location of the blockage. The cardiologist uses sophisticated x-rays and monitors to guide the balloon into place and then inflates the balloon in order to compress the plaque against the artery walls. This opens the coronary artery and results in improved blood flow. A stent may be placed into the artery at the same time. The flexible mesh tube pushes the plaque out of the way and remains in place permanently. For certain patients with blockages in the coronary artery, we may recommend bypass surgery. A bypass is performed in order to create a new route around the blockage; a blood vessel from the patient’s leg, arm or chest is used. Although a bypass is major surgery and requires several weeks of recovery, it is a very effective procedure with an impressive success rate. Emerson Cardiovascular Associates works with many talented heart surgeons who have extensive experience performing bypass, valve and other types of heart surgery. Implantation of a pacemaker: This small electronic device provides effective treatment for a slow heartbeat. There are many reasons why an individual’s heartbeat slows down. For some people, it simply occurs as they age. In other cases, a disrupted heartbeat can occur as a complication from a heart attack. Whatever the cause, a pacemaker can restore a healthy heartbeat. Today’s pacemakers are small devices—about the size of a pocket watch—that are placed just beneath the skin near the heart. Implanting a pacemaker requires a minor surgical procedure; most patients spend one night in the hospital. Once the pacemaker is in place, it monitors the heartbeat, sensing if it is too slow and sending an electrical signal to speed it up. In this regard, a pacemaker serves as a backup system aimed at keeping the heart pumping normally. Certain arrhythmias (abnormal heart rhythms) can potentially cause cardiac arrest—that is, cause the heart to stop beating. This is true of the dangerously fast heartbeat, ventricular tachycardia, and the sporadic, uncoordinated heartbeat seen in ventricular fibrillation. If you are diagnosed with one of these arrhythmias, you may be a candidate for an implantable cardioverter-defibrillator (ICD). ICDs are battery-powered devices that continuously monitor the heartbeat. When an abnormal heartbeat is detected, the ICD delivers an electrical shock to restore a normal heart rhythm. The device, which is about the size of a pager, is implanted in the chest. It is programmed to provide a specific type of therapy, including low-energy pacing, cardioversion and defibrillation. 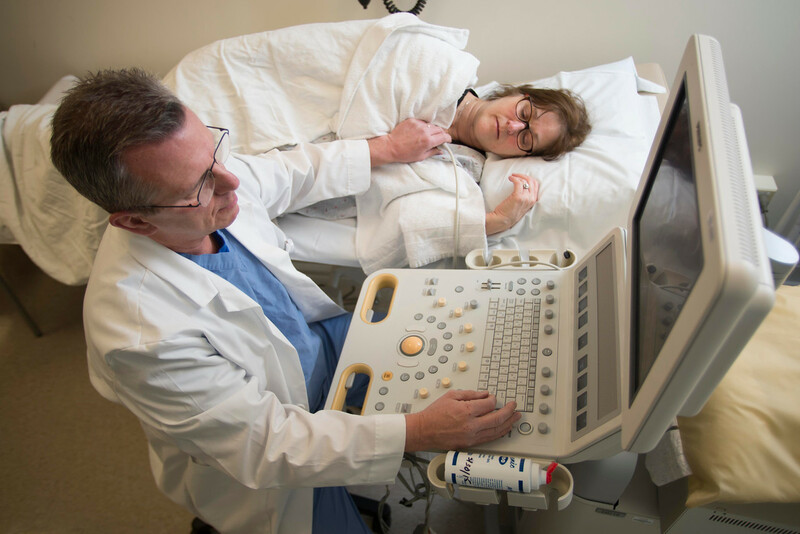 At our Cardiac Device Clinic, patients can be efficiently monitored. This may include having their device’s battery checked, determining that the device is operating effectively or to see if the patient has experienced a heart rhythm abnormality. Many patients can have their cardiac devices monitored remotely over a phone line. Marianne Daoust, RN, a nurse with extensive experience, oversees the Cardiac Device Clinic and works closely with the practice’s cardiologists. who are at high risk for a life-threatening complication, such as cardiac arrest, due to an arrhythmia. Catheter ablation uses catheters—flexible tubing—containing special wires that are advanced through an artery in the groin to the heart. The tip of the catheter delivers energy waves that destroy or scar the problematic cells responsible for the arrhythmia. Once the abnormal tissue is gone, the heart’s electrical impulses will use the normal conduction pathway. If you have an arrhythmia that is best treated with catheter ablation, Dr. Kim can provide this treatment. Cardioversion: For some arrhythmias, this procedure can safely reset the pace of the heart through the administration of a controlled electrical shock. This is aimed at preventing a cardiac event from ever happening to individuals with risk factors for coronary artery disease who may need testing and treatment. Prevention strategies may include managing blood pressure, lowering cholesterol, quitting smoking and exercising. For the person who has already had a significant cardiac event, such as a heart attack or open-heart surgery, the focus is secondary prevention—aimed at reducing the risk factors that can lead to further problems. For this individual, the prevention strategy will be more stringent—tighter control of blood pressure and cholesterol, adherence to a low-fat diet, exercise and frequent checkups, including stress testing or echocardiograms to monitor their cardiac health. We often refer patients to Emerson Hospital’s popular Cardiac Rehabilitation Program, which combines supervised exercise with education, including individual nutritional counseling, and support in order to speed your rehabilitation after a heart attack, bypass surgery or episodes of angina. You do not need to be an Emerson Hospital patient to take advantage of the Cardiac Rehabilitation Program. The good news is that prevention strategies often work well. Motivated patients who are willing to make the necessary lifestyle changes often experience many years of good health, even after a heart attack or open-heart surgery.